Historical places in India tell us country's history and rich heritage. A visit to historical places can prove to be a life changing experience. We can discover the ancient India. We know the reason behind the today's growth. Haldighati is situated 40 km of Udaipur in Rajasthan. This place is a great historic importance because of the memorable battle between Maharana Pratap & Moughal forces of Emperor Akbar. 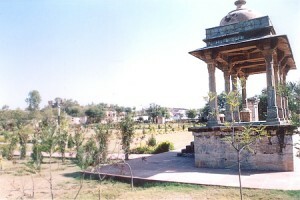 Besides other monuments there is a “Chhatri” dedicated to Chetak, the faithful horse of Maharana Pratap of Mewar in Rajasthan. This entry was posted in Haldighati, Rajasthan and tagged Chhatri, Haldighati battle, mughal. Bookmark the permalink. Copyright © 2019 India Travel Guide.com - Places to Visit In India.